Last night I watched as people greeted Sister at the end of the Late Nite Catechism performance. I've done this several times before and I just love how the audience defers to the actress who plays Sister, Mary Zentmyer. This show is A LOT of fun whether you attended parochial school or not, but you can definitely tell those who are experiencing flashbacks to their school-age years. You can feel the teenage angst in many of the audience members as they come out of the theatre! At intermission, I saw two women who had shown a little too much skin. They had to cover up with a napkin kindly provided by Sister during the show. They obviously thought that part ended when the show did and I couldn't stop laughing as Sister made them put the napkins back on as they left the building! They were good sports about it and will definitely be talking about their experience at the show. I'm sure their friends won't forget very easily either! Late Nite Catechism runs through July 12 and we have a special fundraiser performance and Fish Fry on Tuesday, July 7. Get your tickets to support the Playhouse here. One of the exciting outcomes of the feedback we heard from the community this spring is the recording of a Playhouse "anthem". Susan Baer-Collins and James Boggess created the lyrics and music for the anthem and worked for several weeks with other Playhouse staffers and Delinea Design to get the project off of the ground. A group of performers was selected to record the song at Ware House Productions a week prior to the creation of the video on our Mainstage. 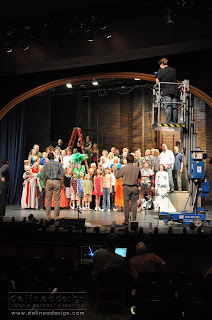 On Monday, June 22, an awesome group of Playhouse actors and crew swarmed the Mainstage for the videotaping. Select actors appeared in costume and everyone wore a smile. The plan is to use the anthem and video throughout the 2009-2010 Season which is our 85th. Keep your eyes and ears open for the final result--you never know where you might see it! Thanks to Playhouse alumni in New York, NY, well-wishes for the 85th year of the Omaha Community Playhouse will be edited into a version of the video. You will be thrilled with who you see. We'll post it here on the blog, so you won't have to look too far for it! The opening production of our 2009-2010 Season, Quilters, has quite a following! Quilters is a musical drama that celebrates the women of the prairie in the 19th century and the place that quilting holds in American society. The play in and of itself is a quilt as it is a series of snapshots of the lives of American women. The Playhouse is pleased to announce the talented cast: LAURA BEEGHLY, BAILEY CARLSON, JENNIFER GILG, KIM JUBENVILLE, CONNIE LEE, EMILY NEVE, SALLY NEUMANN SCAMFER, JODI A. VACCARO, and SUZANNE WITHEM. This group of women will bring the powerful story to life and leave a lasting impression on all who see it. Quilters is directed by Susan Baer Collins and stage managed by Steve Priesman. With music direction by John J. Bennett, choreography by Kathy Wheeldon, and Judie Zinn as the quilting advisor, there is a phenomenal team involved in the making of this production. Another crucial part of the production team thus far has been the Omaha Quilters Guild and Cottonwood Quilt Guild. We are all in awe of the efforts, enthusiasm and artisanship of the guild members. They have been involved since early spring and have created the quilts that will appear in the production as well as organized the Pieces of Our Lives quilt exhibit that will be displayed in the Playhouse lobby during the run of the production. The guilds have been promoting the production and encouraging people from across the region to attend. Season subscriptions including the production of Quilters are currently on sale. Group ticket reservations are being accepted and single ticket buyers are eagerly awaiting the August 11 box office opening date. The show runs August 21-September 27, 2009 with performances Thursday-Saturday at 7:30pm and Sundays at 2pm. Keep checking back to see how things are progressing. Rehearsals start July 6 and we'll be sure to get you some insider pictures and stories! What’s your favorite part of an Omaha Community Playhouse show? Is it the breathtaking sets? Sparkling costumes? Inspiring acting? Whatever it is, one thing is for sure – it is one of MANY aspects that make our productions something our community can be proud of. One of our favorite parts of a production is our Producing Partner, or show sponsor. The underwriting from these friends (individuals, corporations, community groups and organizations) help us provide all of your favorite aspects! Whether it’s the costumes, scenery/sets, special effects, staff associated with a production or more, Producing Partner support is vital to the success of our productions. Producing Partners for our upcoming summer production of Late Nite Catechism are John A. Gentleman Mortuaries and David and Nancy Abboud. Please thank these generous donors if you see them, or patronize their businesses. Backstage of the musical Gypsy looks like any other musical at the Omaha Community Playhouse. Stage managers whisper into their walkie-talkies, actors race around wearing very unusual costumes, and a few people are gathered in the Green Room. But listen closely, and you can hear children. Yes, children. In a musical where burlesque stares you in the face, kids perform. Performing spoofs of songs in Gypsy is popular entertainment, as well. “Caroline” is used a great deal for this purpose. Also, we pick songs like this from the script and use them as duets. Max and I are polishing our harmony for “If Momma was Married”. As you can see, the youngsters of Gypsy refuse to be bored this run. It may take all of our creativity to think up something to do, but eventually we find an activity that passes the time. I know I have sincerely enjoyed working with everyone in this wonderful cast, and my fellow Gypsy kids would say the same as well. Wish us luck in the rest of our run!